Being involved in any type of car accident is a frightening and traumatic experience. When you learn the driver who hit you was uninsured or underinsured, it could send your stress levels even higher. How will you and your passengers pay medical bills if the other driver does not have comprehensive auto insurance, or even minimum liability coverage? Who will pay for repair or replacement for your damaged vehicle? The experienced car accident lawyers at TorkLaw can help you obtain fair compensation for your injuries, damages, and losses when you are in an accident caused by an uninsured or underinsured driver. Liability automobile insurance is required in all U.S. states, except New Hampshire, where you still must prove you can meet certain financial requirements). 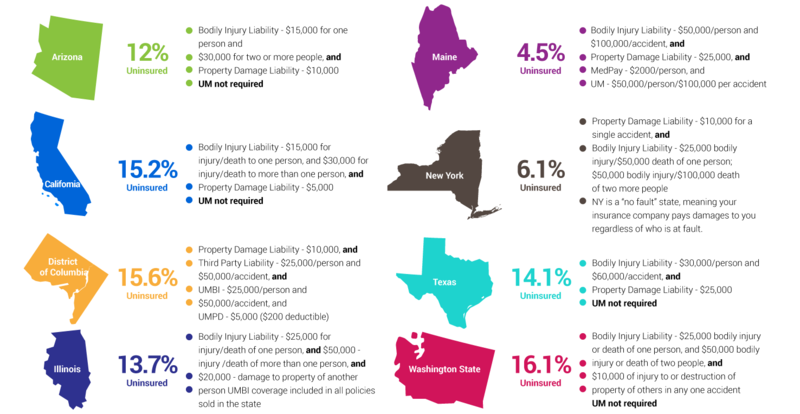 While carrying liability insurance is nearly universal, the type of insurance and required level of coverage varies from state to state. Unfortunately, the Insurance Information Institute reports that approximately 13 percent of motorists did not have auto insurance in 2015. The Financial Responsibility and Insurance Committee found that 82 percent of uninsured drivers surveyed either said they couldn’t afford insurance on their vehicle, or that the vehicle is not in use. Your own auto insurance policy may have coverage in place that will provide payment for your damages when the responsible party’s does not. Refer to your auto insurance policy’s declaration page to find out if you have Uninsured Motorist (UM) or Under-Insured Motorist (UIM) coverage. Uninsured (UM) or underinsured motorist (UIM) coverage usually pays for property damage and medical bills when the at-fault driver doesn’t hold adequate insurance. In addition to collisions with drivers who are uninsured or underinsured, UM/UIM is also applicable in hit-and-run crashes when the driver is never identified. The primary driver listed on a policy that has UM/UIM coverage. Individuals that permanently reside in the same household as a person with UIM coverage (even if that policy holder is not involved in the accident). Those involved in a collision in which an occupant of the vehicle has UM/UIM coverage. 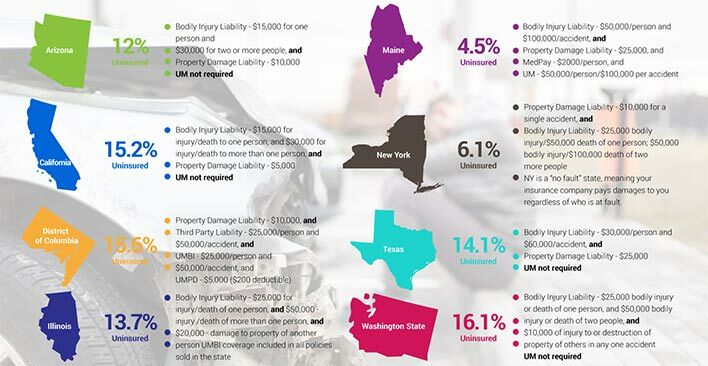 Because this type of coverage is so beneficial, many states require drivers to purchase UM/UIM policies, while other states only require that such coverage is available as a purchase option for motorists. If you do not have UM/UIM coverage in place, we encourage you to add it to your policy, even if you live in a state where it’s not required. If you are involved in accident with an uninsured motorist, you will be glad you did. Automobile liability insurance pays for injuries or damages to those hit by an at-fault driver, but not for injuries or damages of the driver. There is usually no deductible with liability insurance. The liability coverage one has is usually indicated by three numbers; for instance, in California, the minimum liability coverage is 15/30/5. The first number is the amount of coverage for personal injury or death for one person: $15,000. The second number is the amount of coverage for personal injury or death if more than one person: $30,000. The third number is the amount of coverage for property damage: $5,000. Collision coverage pays for vehicle damage in an accident. If you are in an accident with an uninsured driver, and have collision coverage, it will pay for your property damage. It will not pay, however, for damages related to bodily injury. There may be a deductible. Personal Injury Protection (PIP) covers medical expenses regardless of who is at fault. PIP is only available in certain states, and may include coverage for lost wages, substitute services and funeral expenses. There may be a deductible. MedPay stands for “Medical Payments to Others.” It covers passengers’ medical costs directly related to an accident injury that occurred in your vehicle, regardless of who was at fault. MedPay only covers medical expenses (not lost wages, substitute services or funeral expenses), but there is no deductible. In “no-fault” states, injured parties collect from their own insurance company, regardless of fault. Typically, when you are injured in a car accident, and the at-fault doesn’t have auto insurance, there are a few different options to recover the money you need to cover your losses. Determination of fault is one of the first aspects of a case that must be established, as that will dictate how a case proceeds. In “tort states” like California, the at-fault driver is responsible for the resulting injuries and damages like medical bills and lost income. In “no-fault” states, all injured parties collect from their own insurance company. A police report is a vital document to have when making an insurance claim, especially an uninsured motorist claim. Many insurance companies are skeptical of such claims, so a traffic collision report written by a police officer can validate many aspects of your claim, including key facts about the incident, such as the date, location and parties involved. The report will also document if someone does or does not have valid insurance. The next step is to file an uninsured motorist claim with your insurer. If you have uninsured motorist coverage on your plan, you should expect your insurance provider to pay for your medical expenses and property damage, up to your coverage limits. Your claim should be filed sooner rather than later. In some cases, you may only have 30 days in which to file a claim. While an uninsured motorist policy looks good on paper, obtaining the compensation you need and rightfully deserve is not always as simple or as straightforward as it should be. You can greatly improve the process and end result by taking responsibility for your case, for example, collecting evidence, filing a police report, keeping track of all receipts and invoices relating to vehicle towing and repairs, and preserving all records and documents relating to medical care, including doctor’s office visits, surgery, medical procedures, hospitalization records, prescriptions, medical equipment, and receipts for over-the-counter medications, etc. When dealing with insurance companies, keep in mind that their goal is always to increase profitability for their company, which means minimizing or denying your claim. It is not in your best interest to provide statements to the insurance company without first consulting an attorney, as what you say can be used against you. The insurance company will do their best to convince you to settle without input from an attorney. Don’t allow this to happen; once you sign an agreement, you will no longer be able to seek further compensation. There are many questions, concerns and complications surrounding uninsured motorists. If you have an accident with an uninsured driver while operating a vehicle that is not listed in your auto insurance policy, such as a loaner or rental car, your policy may not cover it. If you settle your claim with the uninsured driver without the insurance company’s knowledge or authorization, you won’t be eligible for coverage under the uninsured motorist policy. If you are using your car in a commercial capacity (livery, cab, delivery van, etc. ), you may not be able to collect uninsured motorist compensation under your policy. When you select your uninsured motorist coverage, it is just as important to understand the exclusions to your policy as it is to understand what is covered. What do you do if you have no uninsured motorist coverage and a driver who doesn’t have auto insurance hits you? Your collision coverage will pay for vehicle damage. However, you may not be reimbursed for medical bills. You may consider taking the offending driver to small claims court, but a stated earlier, when a driver doesn’t have auto insurance, 82% of the time, it’s because he or she cannot afford it – which also means he or she cannot pay you. Also, the maximum claim amount for small claims court, usually varies between $5,000-$10,000. Another option for those who don’t have uninsured motorist coverage is to file a notice with the Department of Motor Vehicles showing evidence of the damage your vehicle sustained. The DMV could then suspend the other driver’s license until he or she pays for the damages to your car. Such a suspension could provide strong incentive for the driver to pay you. You may wonder if your insurance company will hike your premiums if you use your uninsured motorist coverage. The answer to this question will vary from state to state. Under California law, insurance companies cannot raise your rates or cancel your policy for making an UM/UIM claim. It is particularly egregious for an insurance company to cancel or raise rates after an uninsured motorist accident, because they are penalizing you for an accident that wasn’t your fault. If you encounter this situation, file a complaint with your state insurance commissioner or contact an attorney who is experienced in bad faith cases. If neither you nor the other driver has auto insurance, or your UM coverage isn’t enough to cover your repairs or medical bills, you will have to pay out of pocket for all expenses, including medical bills and vehicle repairs. As noted above, small claims court may be an option. Driving without insurance is illegal in most states. So, in addition to all the expenses, you may have your driver’s license suspended and be charged additional fines, which are substantial. It’s in your best interest to purchase an insurance policy — one that includes uninsured motorist coverage. It can be extremely frustrating when you’ve been paying your insurance premiums diligently, only to find have your auto insurance company deny your claim. If you believe that your claim has been unfairly denied, or that your insurance company isn’t paying enough on your claim given your coverage, contact the experienced team of attorneys at TorkLaw. They can help you obtain fair compensation for your injuries, damages, and losses. If you have been injured in a car accident by an uninsured or underinsured motorist, seek counsel from a reputable attorney with experience handling uninsured motorist claims. Consulting with the TorkLaw team is completely free. Our team has helped hundreds of people in similar situations and can advise you on the best road forward for your circumstances. If our firm can help you with your case, the individual providing the consultation will inform you during your consult call. Whether or not you would like to accept our services is entirely up to you. Call us today for an obligation-free consultation.